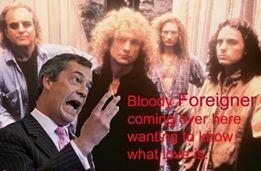 I found these jokes about UKIP on the Facebook pages Britain Furst and Britian First, parodying the Fascist splinter group, Britain First. This new squad of stormtroopers claim to be non-racist, but in fact split off from the BNP. Their policies are, of course, militant super-patriotism, and a hatred of immigrants and Islam. They also specialise in fraud and raising money under false pretences, and tastelessly exploiting the vicious murder of Lee Rigby to push their own anti-Islamic views. The Angry Yorkshireman over at Another Angry Voice has an excellent article demonstrating that they are indeed, Fascists, ’12 things You Should Know about Britain First’, whatever they claim to the contrary at http://anotherangryvoice.blogspot.co.uk/2014/06/12-things-britain-first.html. He has also put up a previous post detailing why he has reported them to the Electoral Commission, because of their misleading advertising. They use issues like animal cruelty to advertise themselves, without mentioning that they are a political party, so that many of the genuine animal lovers who may donate to them are probably unaware that they are a bunch of Fascists. The article’s ‘An Open Letter to the Electoral Commission’, at http://anotherangryvoice.blogspot.co.uk/2014/06/open-letter-electoral-commission.html. The two parody sites have also taken a pop at the racism and xenophobia in UKIP, which is desperately trying to shake off its reputation as the ‘BNP-lite’. Despite Farage’s assertion that they are a non-sectarian and non-racist party, they certainly seem to contain more than their fair share of racists and xenophobes. The stormtroopers of Britain First only managed to put up two candidates at the election, both in Wales, and so urged their supporters in the rest of the UK to vote for UKIP. Hence the parodies of the latter party on the two satirical sites. Here are some of the jokes they put up as a response. Those of us who grew up in the ’80s may remember their song, ‘I want to know what love is’, which had the lines, ‘I want you to show me’. Now we all know my felings on Nigel farade ( clue : hes a LEFTIE LIBERAL ) but when he did that interveiw last week i thought he exelled himself !! He said what were all thinking and if you say you werent thinking what Nigel was thinging then youre clearly lieing !! 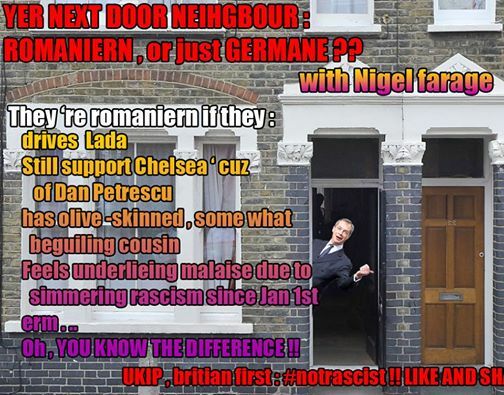 But how do you know weather youre neighbers are Romanien or German ?? Well , heres a czech list ( Gerrit ?? ) to find out !@! Then there’s this from Britain Furst. This refers back to David Icke’s bonkers idea that the world is secretly run by a conspiracy of Reptoid aliens, who have passed themselves off for thousands of years as members of our ruling elites. This includes members of the royal family and, er, Ted Heath, the former Conservative Prime Minister. In an interview on an internet radio show, Icke stated that in the 1980s he was called on to do a television interview. Entering the dressing room, he found Ted Heath already there. Icke greeted him, but the veteran Tory politician said nothing, but coolly looked him up and down. As he did so, he betrayed his reptilian nature as his eyes went completely black. I think this story says more about the possible lighting conditions in TV dressing rooms, and the bizarre state of Icke’s own mind and the fallibility of human memory than it ever does about the supposed reptilian nature of Tory politicos. There are indeed many reptiles on the Tory benches, but sadly, none of them come from outer space and their cold-blooded nature is only metaphorical. 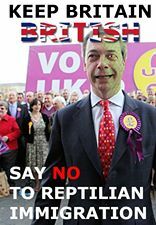 Britain Furst is at https://www.facebook.com/BritiainFurst?fref=ts, while Britian First can be found at https://www.facebook.com/britianfirst?fref=ts. They’re both strongly recommended if you love laughing at Fascists and want to stop them by making them look more ridiculous than they already are.